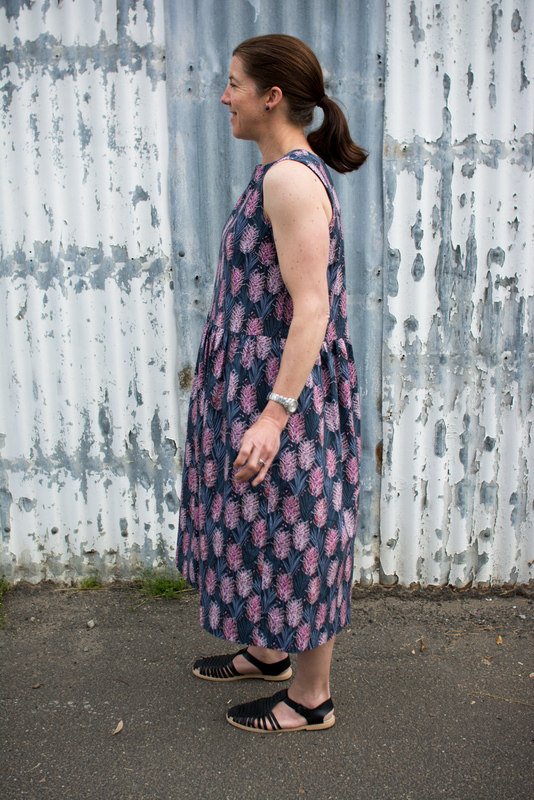 I agree with Flipper not your most flatting dress silhouette but then hot day and big lunch could work. 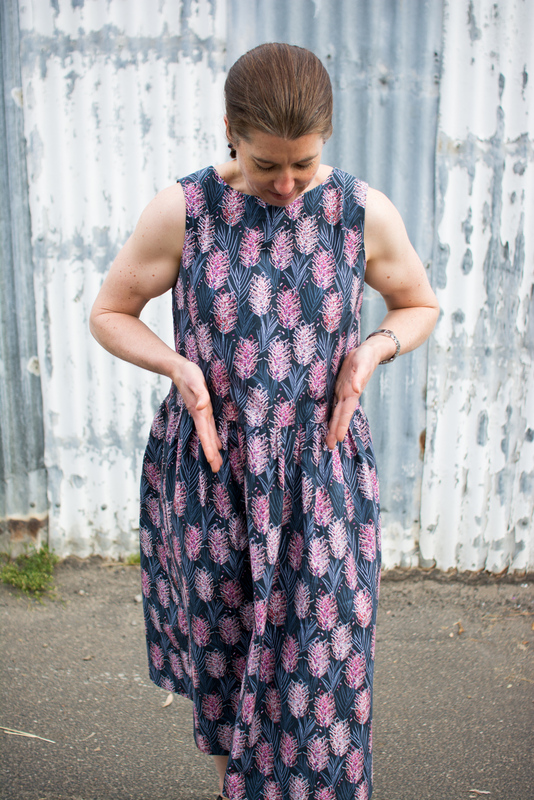 I only have 1 Tessuti pattern and but have kept away from the dresses as they are all rather large in volume. If my arms were as strong as yours I’d be showing off too. I have similar responses to the Tessuti patterns too. I heard the owner talking on the “Love to Sew” podcast recently. She commented that the handrawn, not precise look is what they aim for. Well if I had any hope of ever being "willowy" then I might not be so muscly. Work with the genes you're given, hey! That is an amazing print. In fact, all their prints are amazing. I'll have to deep dive into their website to see if they ship world wide. Enjoy that dress when it gets burning hot. It'll be perfect. THanks Barbara. With a few mods I think it will be useful. The prints are fun aren't they. 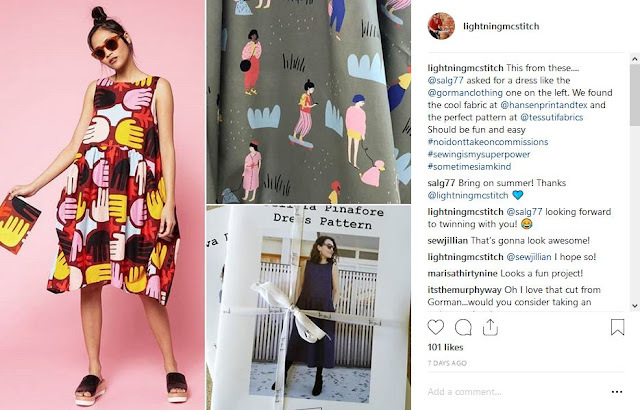 I had wonderful customer service from them when I gave some feedback about the printed fabric width and lack of indication of scale of print. Definitely a company I'd buy from again. Whoa, your arms are ripped! Yeah, the best thing about these photos. I have a dress like this and I chopped it off so it hits above the knee. It's still baggy and I only wear it on super hot days, but the shorter length is less matronly. Maybe worth a shot here? Oh my, Flipper's comment made me laugh out loud! 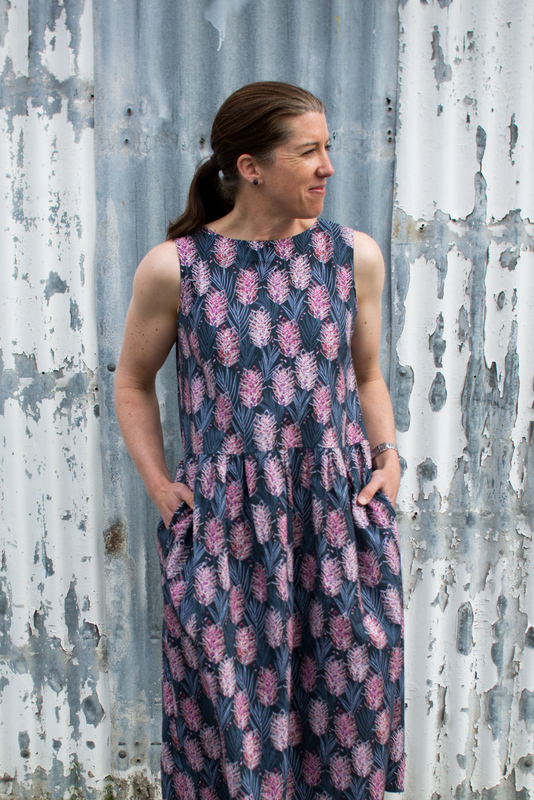 The print is lovely, but the pattern itself would be in a serious oversized danger zone for me! Unless of course it is very hot and I feel like a nice big parma ;) I never bought a printed Tessuti pattern as I cannot justify the cost. I an have them printed at Officeworks on A0 sized paper and it will still cost me less, but I have a computer on my sewing desk, so I don't need to worry about printing out the instructions. Thanks for a fun yet informative post. The fabric is fun isn't it. I'm not sure I'd rate this pattern as worth the PDF cost either. (And round up for the Officeworks printing cause I hate doing it at home). There's maybe a narrow range of fabrics where these oversized dresses hang just so and don't make people look bigger than they are. Or maybe it only works on really slim people where oversized is kinda cute/comical. 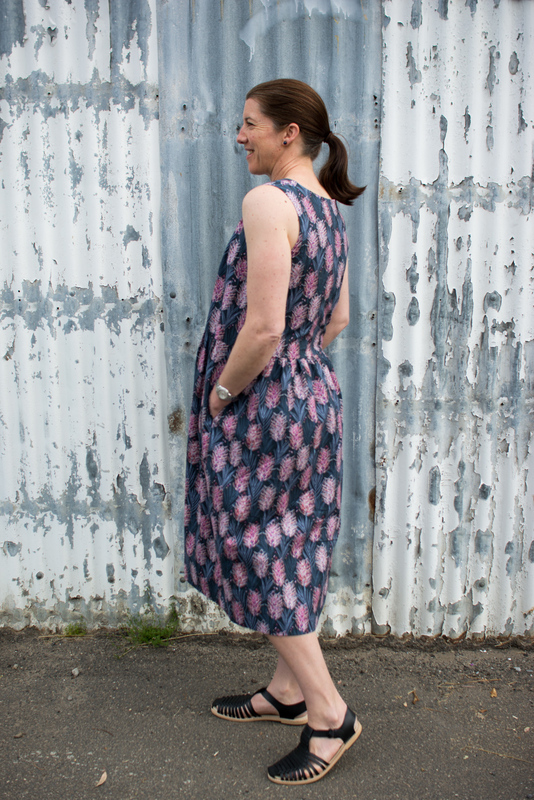 Well they say there are plenty of hot days on the way this summer, so you'll definitely be needing this dress. Now all you need is a nice big lunch! Both of those will definitely happen so that's why I'm letting it hang around. Beautiful fabric, and yes it will be cool on a hot day but I don't like the loose looks in dresses at the moment. I wore loose when pregnant! I have a reasonable figure and don't really want to wear a tent. 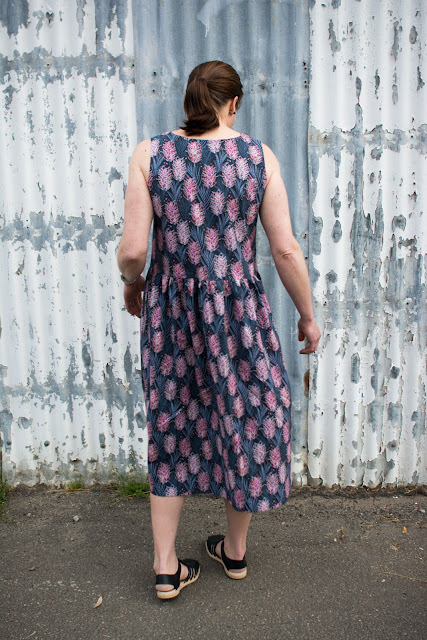 I did buy the Pia dress pattern from Tessuti but that was worn with a belt. I did notice similar fabric in Spotlight's last catalogue. Would certainly be worth adjusting the dress the fabric is too nice not to wear. My experience with Tessuti is very different, and most of my favorite patterns are theirs. They have a lot of sackish dresses, such as the one you chose, and those do not work for me at all, due to my large bust and short stature. That said, I adore the following patterns, and have made more than one of each of them: Ruby, Yuki, Annie, Alice, Bondi, Pia, Leni, Tamiko and Demi. I do not object to the hand drafting, because I find the patterns to be very accurate, legible, and easy to follow. I also very much like the instruction booklets, which I always print in color, for the reasons you stated. If I had to pick just one Tessuti pattern, it would probably be the Ruby Dress, to which I always add the fabulous pockets from the Annie pattern. So, I have a small bust and am moderately tall (170cm/5'7") with an "athletic" build yet it's not doing me any favours either, right?! 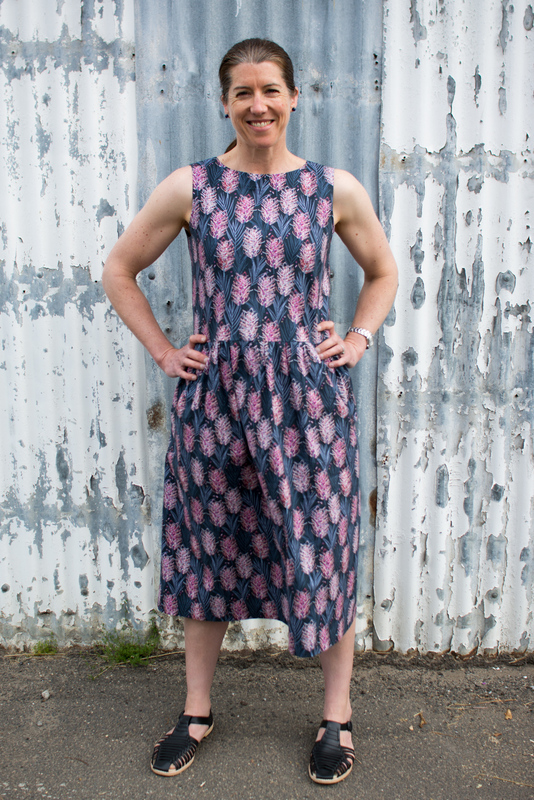 I wonder who does look good in a dropped waist sack dress? Probably those who look good regardless, or in spite of, their clothes.